Feeding your show livestock is part of a daily routine. But did you know there is a science behind that routine? It might seem convenient to feed your livestock twice a day, approximately 12 hours apart, but that routine plays into the consistency that animals rely on and need to keep their digestive tract working at its maximum efficiency, something we don’t often think about as livestock exhibitors. Like most humans, animals are “creatures of habit” and they are better adjusted to daily habits, thus decreasing stress if they are fed, exercised and rinsed on a schedule as part of a routine. And, even though we can’t see it and often don’t think about it, their digestive system also adapts to a schedule to keep it healthy and in proper working order. Digestion varies based on several factors. Feed particle size and quality are two of the biggest factors that impact digestion. The smaller particle size, higher-quality feedstuffs takes a shorter amount of time to digest. And of course, different sized animals digest at different rates. Beef cattle take at least twice as long to digest their feed as other small ruminants or pigs. Feeding approximately every 12 hours makes sense, not as just part of your schedule, but the livestock likely have everything digested from the last feeding and are feeling hungry again. A lower pH is more acidic, and the animal needs time for the digestion to occur, the pH to drop and then to level back up to neutral. “It doesn’t matter the species, animals will always gain more efficiently when there is a routine. For example, if you feed at 7 a.m., and then again at midnight, the animal is hungry for too long. The pH will drop. If they are used to one thing, the digestive system adapts, but if it is a constantly moving target, their digestive system never gets into routine,” Grimes-Hall said. In addition to scheduled feeding times, it is imperative to provide your animals with fresh feed at every feeding. Yes, high-quality show feed can be costly, and it might seem easy to feed a scoop of the “leftovers” in the pan, but there is probably a reason your animal left some behind. Grimes-Hall suggests if your animal isn’t eating the amount you think it should, back off the volume of feed per feeding, then gradually bump up the amount once it starts cleaning up its feed. Next, make sure your animal has access to clean, fresh water at all times as water intake is directly and positively correlated to feed intake and is the most important nutrient for all animals. If you don’t have a free-flowing water system, make sure to clean your buckets daily, so the water your animal is drinking is fresh. 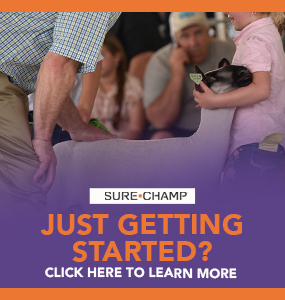 Finally, to help make sure your animals keep eating and their digestive tract stays healthy, be sure to provide them a digestive supplement like Sure Champ® every day. 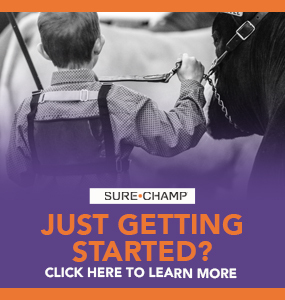 All Sure Champ products contain Amaferm®, a precision-based prebiotic designed to enhance digestibility by amplifying nutrient supply for maximum performance. It is research-proven to increase water and feed intake. In addition, research shows that Amaferm decreases body temperature in heat-stressed animals. 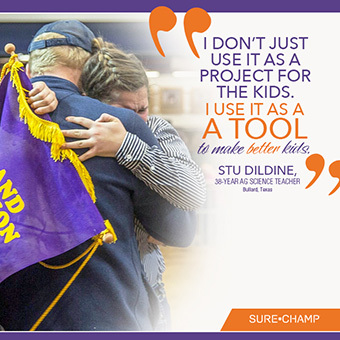 With a product like Sure Champ, you are keeping the good bugs in the gut and keeping the bad bugs out. 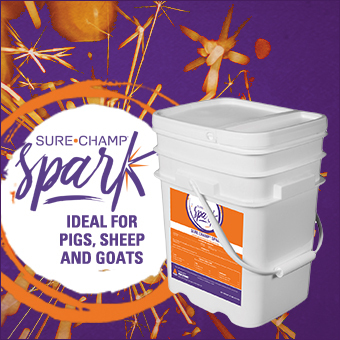 And, there is a Sure Champ product available for cattle, sheep, goats and pigs. 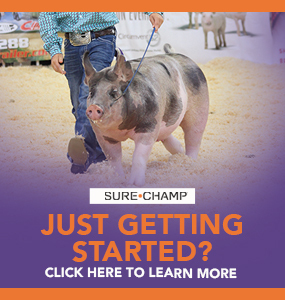 It could be easy to overthink this very important step in preparing your show animals, but when you are consistent with your feeding times and rations and provide fresh, clean water and the Amaferm advantage, feeding livestock becomes simple.